When it comes to nature tripping, one of my favourites is the Longwood gardens. In fact, we are already a garden pass member together with my husband. We have been visiting the gardens for many times now, but in fact, we haven’t completed visiting all the gardens yet. Well, at least we all have the valid reasons to keep going back J.
Longwood Gardens had its centennial celebration, in the year 2006. It started in 1906, and with its 100 years of existence, it had gone a long way of better improvement and constant nurturing that the beauty of it became one of the most visited gardens in the whole world. Longwood Gardens is located on US route 1, about 3 miles northeast of Kennet Square, PA, 30 miles west of Philadelphia, PA and 12 miles north of Wilmington, DE. In 1906, industrialist Pierre S. Du Pont purchased the property to save its collection of historic trees. His preservation efforts blossomed into a full-fledged passion for gardening that has rarely been equalled. Over the past 100 years, Longwood Gardens has matured into one of the world’s great horticultural showplaces. It is not only a garden per se, but also showcases the excellence and innovation in preservation, horticulture, education, philanthropy and the performing arts. 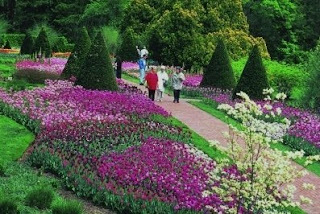 There are at least 31 (and more are coming) outdoor gardens in Longwood Gardens. To find out, the only thing you can do is visit the gardens. You will be awed by the garden’s beauty as you see various trees and plant collections in different gardens.